Brand and Service quality of every organisation can be judged only on the ‘appearance’ and ‘feel’ of its website. Unique and creative website designs always engage users only if the website has interactive User Interface with improved user experience, these strategies helps to stand out among the competitors. We listen to you, collect every piece of information about your business, your vision, your values, your organization, your product and put all these together to make your website unique. We @ Digital Atrium specialize in giving your site a new-fangled look which is fresh, user-friendly and appealing. 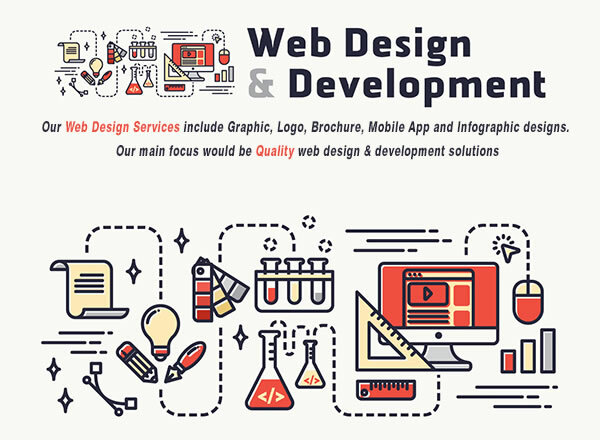 Unlike other website designing company, we not only work towards developing a good design but also tweak and optimize your website design that helps in improvising business growth. We being the best Web design and development service provider know the importance of website designing for every business and pay keen attention to make our web designing services worth for your business and take an active approach to understand your business, your industry, target market and your competitors to make sure that every design element in the website works to achieve your marketing goals. Every web solution offered by Digital Atrium will be optimized for various devices so that you do not have to worry about responsiveness over tablets, smartphones or desktops. Better to say, we make you look good online. Leave your website development worries, let us help you develop an effective website solution for your business, tailored to honing in on your prospective clients. If you’re not sure which WEBSITE plan to select, simply get in touch with us. Our experts will help you select the plan that’s best suited for you.